Succulentsare perfect plants for the water conscience gardener. In fact, the quickest way to kill a succulent is by over watering it or planting it in a soggy location without good drainage. Because of their easy care and small roots, these days succulents are tucked into all sorts of creative planters and mini/fairy gardens. While you can go to almost any home improvement store or garden center and purchase adequate succulents, rare varieties, such as Turkish stonecrop (Rosularia spp. ), may only be available in specialty nurseries or online. Many crafters, like myself, like to try out the latest trends while adding our own unique flare to these projects. Rosularia makes an excellent, unique addition to succulent crafts. Continue reading for more Rosularia information. Turkish stonecrop, aka Rosularia, is a rosette forming succulent that looks similar to Sempervivumor Echeveriabut is actually related to Kalanchoeand jade plant. Native to Turkey and areas of the Himalayan Mountains, most Rosularia varieties are hardy down to zone 5, with a couple varieties hardy to zone 4. Alhough Rosularia is not actually a Sempervivum, they are usually listed with them because the two plants have a very similar appearance. 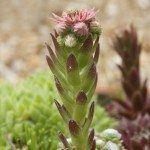 Rosularia grows in small rosettes with flat green succulent foliage, much like hens and chicks. Depending on variety, Rosularia foliage often has red, purple or yellow margins that may be covered in tiny hairs, called cilia. When present, these small hairs help plants capture water and nutrients and transport them to the root zone. What obviously sets Rosularia apart from Sempervivum are the flowers, which bloom in midsummer. While flowers of Sempervivum and many other related succulents are star shaped, Rosularia flowers are small, tube or funnel shaped atop tall stems that grow up from the center of the rosette. These blooms can be white, yellow, pink or purple and may even be variegated, depending on variety. After Sempervivum blooms, its rosette dies. After Rosularia blooms, its rosette continues to live and can produce more flowers. To deadhead spent blooms, simply cut the flower stems back to the rosette. Rosularia plant care requirements are the same as most succulents. They grow best in full sun to part shade. Soil must be well draining, as succulents will rot when kept too moist. Because of its low water needs, Rosularia is an excellent plant for xeriscaping, using in rock gardens or tucking into gaps in stone retaining walls. The worst thing you can do to Rosularia is over water it. New plants should be allowed to dry out between waterings. Older, established plants should only be watered in times of extreme drought. In spring, fertilize Rosularia with a 5-10-10 slow release fertilizer. At this time, you can also give the plant a boost of phosphorus with bone meal. Being a rare succulent, Rosularia may be hard to find at local garden centers. If ordering online, it is best to purchase live plants, as they are very hard to propagate by seed. Rosularia is most commonly propagated by division of the small rosette “pups” that it produces around the main or “mother” rosette. To propagate from pups, gently remove them from the mother plant, making sure to leave the pup’s own roots intact. Then simply plant these pups in the garden, or in a container with a sandy soil mix or cacti potting soil. Read more articles about Rosularia.